Like many of you, I’ve always had an interest in desert racing. Living in Ohio, the reality of seeing a race in person is somewhat remote. I never wanted to travel all the way out west for a race that I might not even get to view. This spring I was fortunate enough to get an invitation from Rumblegoat Racing (www.rumblegoatracing.com) to be a guest of their team for the Best In The Desert (BITD) Terrible’s 250 desert race in Primm Nevada. Rumblegoat races a 2006 Ford Ranger (nicknamed ‘El Chivo’) in the BITD 7300 Pure-Stock Mini/Mid-Size Pick-Up class. This is as stock as it gets. Other than the required safety equipment, the truck rides on 33-inch tires thanks to clearance gained from the torsion bars and a metal body lift. The rear axle is heavily trussed and the transmission has enough remote cooling for a refrigerator. The axles have also been re-geared. The trip started out by getting our plane tickets. It’s always best to book a flight as early as possible to get the best deals. Two round trip tickets for my wife and I came to $500.00. It was actually cheaper to fly home on Monday April 20th than on Sunday the 19th, so we stayed until Monday. Rumblegoat offered to provide a room for us in Primm on April 17th and 18th, so we booked our own room in Las Vegas for April 16th and April 19th. We travelled 2,510 miles to get from our home in Ohio to Primm Nevada. Our flight left Pittsburgh Pennsylvania and flew to Dallas/Fort Worth Texas. From there we caught a flight to Las Vegas. The Dallas/Fort Worth airport was a bit complicated. American Airlines changed our gate on us at the last minute, and we found ourselves rushing to another part of the airport to catch our flight. When we arrived in Las Vegas we needed to find transportation to our hotel. We hadn’t planned on renting a car until Sunday since the team offered to haul us around with them. We walked out to the shuttles in hopes of catching one to our hotel. We were greeted by a limo driver who told us our hotel was to far out for a shuttle. He told us that if we got a taxi we would have to stand in a long line and the taxi would cost $60.00. He offered to take us right away in the limo for $80.00. We walked over to where the taxis were and got in the long line. The line moved amazingly quick and we soon found ourselves at our hotel after paying for a $24.00 taxi ride. As suspected, the limo guy was full of BS. When we arrived at the hotel (Boulder Station) we met up with Don Healy, the primary driver for Rumblegoat Racing. Don introduced us to a few team members before we set out to find our room and get some sleep. On Friday we met Don and a few others and rode with them down to Buffalo Bills Casino/Hotel in Primm Nevada. Yes, Buffalo Bills has a roller coaster that goes through it. When we arrived we found race vehicles everywhere in the parking lot. Teams were lined up and were going through contingency. During contingency, teams move their truck along rows of sponsors and get sponsor logos to put on their race vehicle. If they win the race, their is some predetermined pay out to the team if they’re displaying the sponsors logo. The final stop is the tech inspection by BITD officials. A few sights and sounds from contingency. Buffalo Bills is designed to look like an old western town inside. Pretty cool. Oh…and you just have to try your hand at the slots! I played the penny slots. A real High Roller! We had fun doing it and didn’t lose any money. We met with the team at their pit for a meeting with team manager Jim Moss. Jim Moss puts a lot of emphasis on safety, and went over the teams safety procedures and responsibilities before heading over for BITDs drivers meeting. The team also sticks to a strict rule of not consuming ANY alcohol 24-hours prior to the race. The drivers meeting was packed as BITD’s Casey Folks went over information on the race, race markers, speed limits for restricted areas, and the upcoming Vegas to Reno (V2R) race. The pits are right next to the road across the street from the mall. You can literally walk across the street and either go shopping or grab some food. On Saturday morning we got up at 4:00 am and were in the pit by 5:15 as the team prepared for the 6:00 am start. The trucks started two at a time side by side off the line. Note the blue light on the back. That’s to let the faster classes know they’re coming up behind a slower class vehicle. Once the truck was under way, we went over to the main pit to track the truck and other competitors on the computer. BITD requires all race vehicles to have an IRC Iritrack system so the vehicles can be tracked on a computer. Not only does this allow the teams to see what their position is in relation to other race vehicles, it also allows you the fan to follow the race on your computer at home. All you have to do is go to www.racetheworld.net and look for the race you want to follow. Unfortunately after about 32 miles into the race, El Chivo lost it’s transmission. The reason is unknown at this time. All we know is that it lost all its gears and wouldn’t move. We made some phone calls to some local salvage yards and we even talked to Rob MacCachren to see if he or Steve Olliges had a spare transmission. None could be found. With Rumblegoat out of the race, my wife and I went to grab a bite to eat, and then went over to the grandstands. The grandstands are right behind Buffalo Bills Casino/Hotel at the edge of the parking lot. From here, you can see the vehicles come through a short course for the fans to watch. The short course in front of the grandstands. Here’s a random sample of the grandstand action. The best part about the grandstands is that it didn’t cost us anything to sit and watch. It didn’t cost anything to see any of the racing or contingency. It’s all wide open for you to come and look at. If you lived within driving distance, you literally could have came and experienced all of this for free. Before ever heading out to meet Rumblegoat Racing I wondered what the experience would be like. What would we be able to see, if much at all. It was an amazing experience. I would definitely go out again next year to watch the race at Primm. We were close up to all the action and everything was close and readily available. The hotels/casinos were nice and the food was good. Anyone wishing to attend could have came out and saw the contingency and race for free. You could have stayed at Buffalo Bills and been able to walk right out to contingency, the grandstands and had access to food, shopping and entertainment all in one small area. 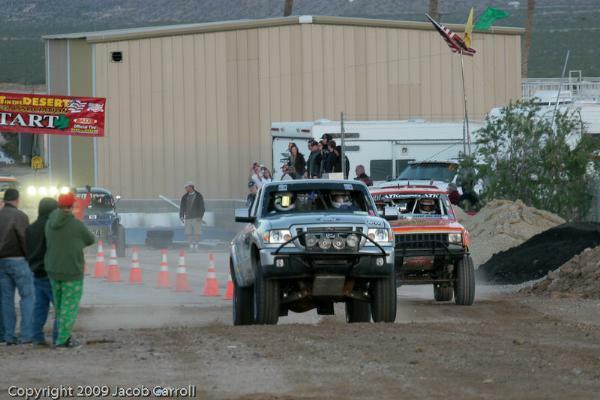 I would strongly encourage our readers to head out to the race next year in Primm. Don Healy for his invite, driving us around, and for taking us in to Vegas Saturday night and hanging out. Team Manager Jim Moss for getting us a room Friday and Saturday and letting us be involved. Ron Moss and his wife (Jim’s parents) for taking me to the car rental on Sunday. They’re a really nice couple. All the team members who let us hang out with them for the weekend. There’s no doubt from tracking Rumblegoat on the Iritrack that they would have won it if it wasn’t for the transmission issue. They had been leading up to that point. This wasn’t a failure that was any fault of the team. It was just part of racing. Hopefully they can find a shop who can build them a new transmission that will hold up to the abuse of desert racing. That combined with their win from the previous Parker race, and Rumblegoat has a very strong chance at winning the BITD Class 7300 championship. How has the race effected me? I keep checking the Vegas weather every day on my phone and comparing it to Ohio. I already told the wife that going to Primm every year in May would be a great way to start the year. I definitely plan on making a trip out there again.